We must accept that God surprises us, that he intervenes in our lives producing unexpected changes, opening unprecedented horizons, removing insurmountable obstacles. They are changes that surprise us and the newness is disconcerting and makes us afraid, as well as the changes that God brings us and the innovation that God asks of us. Sometimes they are such drastic changes in life that we feel disoriented; sometimes they are risks that we have to take – and from which we would like to flee. They are God’s surprises. Although we cannot explain some situations that we experience – and with our limited understanding, we don’t find any logical explanation – we always trust in the God who surprises us by acting unexpectedly. It’s not easy to let yourself be surprised by God. It requires a high dose of trust in his love. But it is better to abandon ourselves into his hands, even without understanding, than to be paralyzed by fear or enslaved to security and nostalgia that deceive us. Bishop Silvio José Báez, O.C.D. Hay que aceptar que Dios nos sorprende, que interviene en nuestra vida produciendo cambios inesperados, abriendo horizontes inéditos, quitando obstáculos insalvables. Son cosas nuevas que nos sorprenden y la novedad disconcierta y nos da miedo, también la novedad que Dios nos trae, la novedad que Dios nos pide. A veces son cambios tan drásticos en la vida que nos sentimos como desorientados, a veces son riesgos que hay que correr de los que quisiéramos huir. Son las sorpresas de Dios. Aunque no logremos explicar algunas situaciones que vivimos y con nuestra limitada razón no le encontremos lógica alguna, tengamos confianza siempre en el Dios que nos sorprende actuando inesperadamente. No es fácil dejarse sorprender por Dios. Se requiere una alta dosis de confianza en su amor. Pero es mejor abandonarnos en sus manos, aun sin comprender, que quedarnos paralizados por el miedo o esclavizados a seguridades y nostalgias engañosas. Monseñor Silvio José Báez, O.C.D. 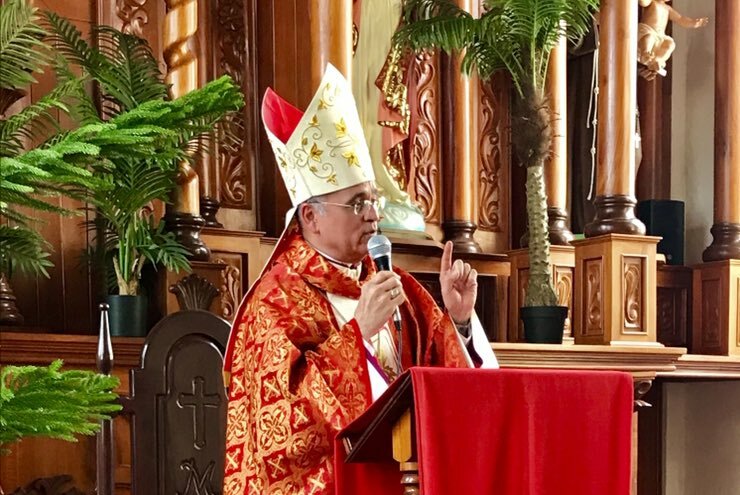 On Easter Sunday 21 April 2019, Silvio José Báez, O.C.D., who is the Auxiliary Bishop of the Archdiocese of Managua, said goodbye to the faithful as he moves to Rome at the request of Pope Francis to assume a new ministry. The Discalced Carmelite friar explained that he knows from personal experience in this transition that it is better to choose the path of abandonment than to cling to false security and nostalgia that does nothing but deceive and disappoint. He does not know yet what his new post will be, nor for how long he will be away from the archdiocese. The blogger serves as the English translator for Bishop Báez in social media. This translation is the blogger’s own work product and may not be reproduced without permission. Just as the grain that dies in the earth is the beginning and origin of many others, in the same way the death of the first missionaries to the Congo in the ocean was the cause of many religious who offered themselves to the Father Provincial, with letters full of urgent pleading to go and take their places in the Congo. Six months before her death, Saint Teresa of Avila sent the first Discalced Carmelite friars on a mission to a foreign shore. On 5 April 1582 King Philip II of Spain went to the port of Lisbon to personally bid farewell to the missionaries on board the Portuguese carrack (não) San Antonio headed to the Congo. The king himself gave the signal to the ships to cut the moorings and hoist the anchors at 6:00 in the morning. Tragically, the San Antonio sank and all on board perished. Be careful that you do not stop going to confession, and tell the same to your sisters. May you all recommend me to God, for I will never forget to do so for you. In order that God might give His grace to those who do not or cannot ask it, or who do not wish to ask it, He enjoined us to pray for one another, so that we might be saved (Jas 5:16f). If God gave the grace of conversion to St. Augustine, it was due to the prayers of St. Monica; nor would the church have St. Paul, according to one of the fathers, were it not for the prayers of St. Stephen. El obispo auxiliar de Managua, monseñor Silvio Báez, exhortó a los participantes en la negociación entre la Alianza Cívica y el régimen a que prevalezcan sus valores cristianos y no anteponer la estabilidad financiera a la persona humana. ¡oh Virgen gloriosa y bendita! Yo le digo que no sea boba, ni ande con temores que acobarden el alma. Dele a Dios lo que le ha dado y le da cada día, que parece quiere ella medir a Dios a la medida de su capacidad. Pues no ha de ser así. Aparéjese que le quiere Dios hacer una gran merced. Para cuya inteligencia es de saber que el alma más vive donde ama que en el cuerpo donde anima, porque en el cuerpo ella no tiene su vida, antes ella la da al cuerpo, y ella vive por amor en lo que ama. Panajachel 16 de febrero de 2019 Guatemala”…pascua de quiebracajetes” (M.A.Asturias). Estamos viviendo un período en el que la amistad compite con la tecnología. Todos tenemos la necesidad de sentirnos apreciados y admirados, una palmada en la espalda, un abrazo, una sonrisa, un apretón de manos, un saludo, nos hace sentirnos bien…. For a long while now I have hardly been able to do any work. From the beginning of September until the middle of December, I took care of our good, eldest lay sister, Sr. Clara (cancer of the liver, as far as the doctors can tell). Then I got the office of turn-sister [portress], which means being a contact between the cloister and the outside world. You can imagine that for this one needs a serviceable walking apparatus. I hope to be allowed to make my perpetual profession on April 21. Soon thereafter follows the Veiling Ceremony. That is, again, a big public celebration that the beloved baptismal sponsor [Hedwig Conrad-Martius] should not miss. Hopefully the League of Academics will again cover the cost of travel. We celebrated the 300th Jubilee Year of the Cologne Carmel for four days at the end of September/beginning of October. Our dear Mother <Teresa Renata> wrote a beautiful commemorative booklet for the occasion. I believe you will receive it as a gift when you next visit us. Do you know that Husserl’s health is very poor? This summer he suffered a severe recurrence of pleurisy and is not recovering well from it. Would you write to him sometime perhaps? They now live in Freiburg-Herdern, at Schöneck 6.